You can hike, bike, ride a snowmobile or ride horse on the Pat McGee Trail. This mile multi-purpose 12.2 trail will grow to be a county-wide system but at this time it connects 7 municipalities together (the Village of Cattaraugus to the City of Salamanca). On the trail, you can enjoy quiet contact with nature on the Pat McGee trail. It offers woodlands, wetlands, and green-space that is home to a wide variety of animals, birds, and vegetation. The trail has six bridges that cross several streams. The longest bridge is over 100 feet in length. Signage along the way explains geology of the area, historic areas, conservation projects, and wildlife. There are five trailheads. 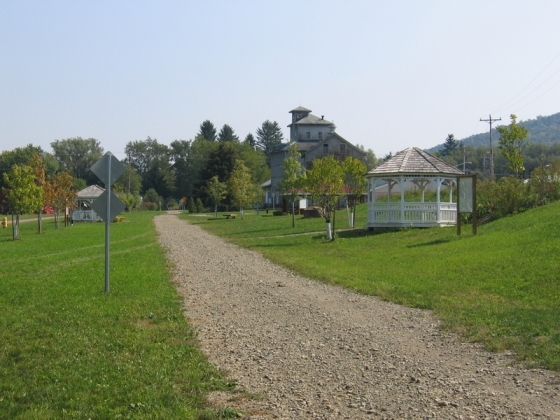 The major trailhead, with a small community park consisting of a picnic shelter and two gazebos, is located in the Village of Little Valley. This trailhead is approximately halfway between Allegany State Park and Zoar Valley. The only section of the trail that is paved is from this trailhead south to the Little Valley Community Recreational Park. The rest of the trail is composed of an aggregate over the original rail-bed. 174 species of plants, and trees. There are 10 different geological phenomena along the trail including a continental divide. Because the trail runs down the spine of the county, numerous horse and snowmobile trails intersect and loop off the trail (the trail is corridor #1A on the NYS Snowmobile network). The North Country National Scenic Trail, Bi-Centennial Bike Trail and the Finger Lakes Trail all cross the Pat McGee Trail. Interpretive educational signs were placed along the trail. Updated on Fri, 09/05/2014 - 3:06pm.